Crown copyright ©. 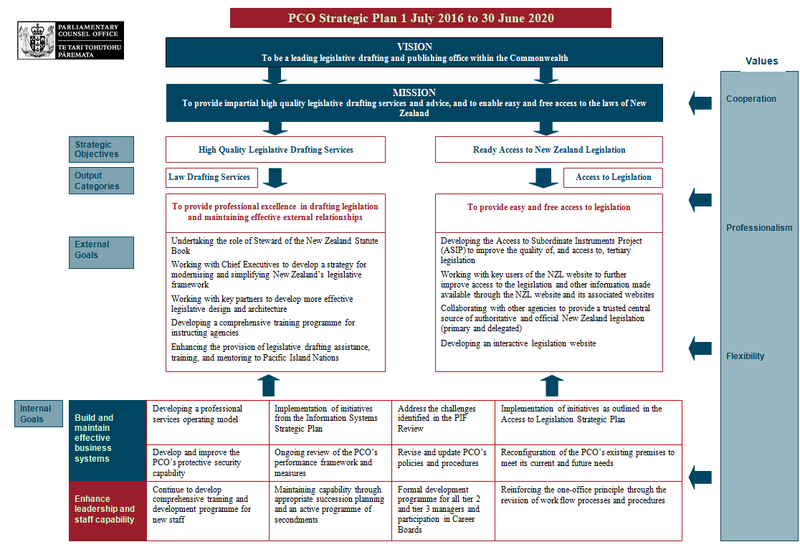 The 2016 Parliamentary Counsel Office Four-Year Plan is licensed under a Creative Commons Attribution 3.0 New Zealand Licence. In essence, you are free to copy, distribute, and adapt the work, as long as you attribute the work to the Parliamentary Counsel Office and abide by the other licence terms. Please note that neither the Parliamentary Counsel Office logo nor the New Zealand Government logo may be used in any way that infringes any provision of the Flags, Emblems, and Names Protection Act 1981 or would infringe such provision if the relevant use occurred within New Zealand. Attribution to the Parliamentary Counsel Office should be in written form and not by reproduction of the Parliamentary Counsel Office logo or the New Zealand Government logo. Legislation Amendment Bill – this Bill is currently awaiting its first reading in the House. The PCO intends to update and incorporate the Interpretation Act 1999, (currently administered by the Ministry of Justice), into the Legislation Act 2012. PCO will then take over responsibility for administering those provisions once incorporated. Access to Subordinate Instruments (not drafted or published by the PCO) – the PCO has established a project team to develop the PCO’s information and business systems so that all subordinate legislation (whether drafted by the PCO or other agencies) is available on the New Zealand Legislation (NZL) website. The Access to Subordinate Instruments Project (ASIP) will provide a single, official, public source for all NZ legislation. This project is part of the PCO’s continuing programme to improve access to legislation in New Zealand and is in response to a directive from Cabinet to investigate a means for ensuring access to all NZ legislation. This follows the PCO’s discussions with the Regulations Review Committee over its inability to easily identify and track disallowable instruments that are not drafted and published by the PCO. It also responds to issues identified in both the reports of the Whey Protein Concentrate Contamination Incident Inquiry and the Productivity Commission into regulatory institutions and practices in New Zealand. It also responds to one of the challenges raised by the reviewers in the recent Performance Improvement Framework (PIF) report of the PCO. Legislation Design and Advisory Committee – the Government agreed with a recommendation from the PCO and the Ministry of Justice to revive and merge the Legislation Design Committee with the Legislation Advisory Committee (LAC) into a Legislation Design and Advisory Committee (LDAC). The changes are designed to address concerns that the LAC is often brought in too late in the process to resolve problems in the basic framework and architecture of legislation or to identify potential rule of law issues; and significant time, resources, and effort are required in providing LAC submissions to select committees – at too late a stage in the process to affect legislative design. The LDAC has now been established and is actively working with departments and agencies to assist them in designing major legislative proposals and to maintain the currency of the revised LAC Guidelines (2014 edition). The PCO is now providing the committee with policy and secretariat support, based at the PCO, from within its current appropriation. New Zealand Legislation (NZL) system – PCO has increased the coverage of “official” status to the legislation contained on the NZL Website by declaring official, the HTML versions of legislation bearing the New Zealand crest. The PCO, while continuing to drive down the costs of operating the NZL system, has invested capital and other resources in the maintenance and development of the drafting and publishing system which underpins the NZL Website to increase the coverage and scope of legislation contained within those databases and to ensure sustainability and endurance of free access to legislation for New Zealanders. sustainability in terms of local capability building is an ongoing challenge because of the nature of the activity and there is scope to reorient the focus of the activity to include a greater capability building component. Stewardship of the Statute book - the PCO’s formal Performance Improvement Framework (PIF) review identified the stewardship of the statute book as a key challenge. Stewardship is defined as the active management and planning of a resource or asset on behalf of another group for the medium to long term. It means PCO will undertake a proactive duty of care for the statute book for the benefit of users. PCO will proactively monitor and review the state of the statute book and advise the Attorney-General on what should be done to ensure that it remains accessible and authoritative. The PCO will work with the central agencies and parliament to develop a strategy to modernise and simplify New Zealand’s legislative framework. To give effect to its broader stewardship role, the PCO will seek to improve the standard of drafting instructions advocating clear principles for legislative design through earlier involvement and targeted education and training, ensuring consistency of drafting and advice, and making the New Zealand Legislation website a complete source of legislation. Access to Subordinate Instruments Project (ASIP) – this is a very large project with wide-reaching implications. The project is expected to take a number of years and a large financial investment to complete. modifications to PCO’s publishing system and the New Zealand Legislation website so as to simplify, broaden, and improve access. an informal design phase which is focussed on project scope, exploring legal and procedural consequences, document design, discussions with external stakeholders, analysis, testing, refining and documenting the project design, exploratory drafting of the required legislative changes, establishment of a consultation plan, create a project plan and undertake a gateway review. The formal project phase, where the main activities will include building and testing the IT components, drafting the legislative changes required, finalising the project plan, and instituting formal project disciplines including governance oversight, budget, timetable, and documentation systems. The implementation phase, which will entail rolling out the IT components, training users from government agencies, enacting the legislative changes required, rolling out the changes to the New Zealand Legislation website, and communications with all users. Working with partners to improve access to legislation in New Zealand – to give to effect to its stewardship role the PCO will continue to work with the New Zealand Legal Information Institute (NZLII), National Archives, the Office of the Clerk, universities in New Zealand, and commercial publishers to provide collections and databases of historical Bills, Statutory Regulations, and orders as well as the digest of the Regulations Review Committee decisions and reports. The PCO will also work with the Office of the Clerk and other agencies to improve the presentation of, and access to, draft legislation introduced into the House of Representatives. Improving the quality of New Zealand legislation – to give to effect to its stewardship role the PCO will continue to keep under review drafting quality standards. A review of the quality assurance processes was completed and a report presented to the Senior Management Team in August 2015. The review found that overall the PCO was producing good quality legislation but the quality assurance system was not functioning as well as it could. The Senior Management Team will determine how, and if, the recommendations can be implemented and with what priority. Consideration will also be given to increasing the use of standard clauses in legislation and the use of software products to enhance the readability of legislation. New Zealand Legislation (NZL) system – the PCO intends to make further enhancements and simplification of the NZL system to make it easier to use and maintain, and to provide better value for money and lower cost of ownership to the Crown. The PCO, while continuing to drive down the costs of operating the system, will invest capital and other resources in the maintenance and development of the drafting and publishing system which underpins the NZL website to increase the coverage and scope of legislation contained within those databases and to ensure sustainability and endurance of free access to legislation for New Zealanders. The ASIP Project mentioned separately (under Highlights and above) will also have significant development and cost implications for the NZL system which the PCO will manage over the four-year period. Revision programme of statutes – the PCO will continue work on the first 3-yearly revision programme of statutes. That programme proposed seven revision Bills that will revise 18 Acts. The PCO will also start work on a further 3-yearly revision programme of statutes for the 52nd Parliament, currently scheduled for late 2017. Providing Pacific Island nations with drafting support and training – PCO will continue to work with MFAT and other agencies to secure a sustainable funding arrangement to meet the need for this service, given the benefits both to good governance and the rule of law in those nations but also the benefits to New Zealand within the Pacific region. Further work with particular nations will be undertaken on the basis of meeting the requests and requirements of those governments’ legislation programmes. Legislation Amendment Bill - as detailed under Highlights. Legislation Design and Advisory Committee – the PCO will consider what effective legislative design entails and what this means for the Committee and the work it is to do. The PCO will also continue to provide the committee with policy and secretariat support, based at the PCO, from within its current appropriation. Further development of this service and the cost pressures associated with any growth in its provision will be kept under review to ensure that it does not adversely affect the financing of the PCO core statutory functions. The key strategic challenges and opportunities facing the PCO over the next four years include ensuring that the PCO is proactively positioning itself to meet the needs that the users of the PCO’s services are likely to demand from us in the future. This will entail identifying the changes we need to make in the way we deliver our services to ensure they continue to be effective and beneficial for our users. Other key strategic challenges and opportunities will include ensuring we have staff resources with the appropriate capabilities, further development, maintenance, and support of its technical systems and assets, and enhancing the support provided to and Pacific Island nations and LDAC. The PCO’s vision is to be a leading drafting and publishing office within the Commonwealth. The PCO is also responsible for developing three-yearly statute law revision programmes in time for each new Parliament. The purpose of revision is to rationalise and more logically arrange statutes and sections within them, remove inconsistencies and overlaps, repeal obsolete and redundant provisions and modernise expression, style, and format. In the first of the revision Bills, the PCO is primarily focussed on tackling New Zealand’s many contract and commercial statutes. These are largely older Acts that are expressed in language that is out of date and many provisions have been repealed. Their consolidation in a modern form will make them more accessible and reduce regulatory costs for business. The PCO also provides advice on the drafting of disallowable instruments that are not drafted by the PCO. The 2012 Act provides for the disallowance of certain instruments made under enactments. All legislative instruments stand referred to the Regulations Review Committee and must be presented to the House for scrutiny by that committee. The PCO arranges this without the involvement of the instructing department or agency. The PCO, with funding from the Ministry of Foreign Affairs and Trade (MFAT) Aid Programme, provides legislative drafting assistance, training, and mentoring to officials responsible for drafting legislation in Pacific Island nations. Under the 2012 Act, the PCO is also responsible for supplying copies of Bills and Supplementary Order Papers (SOPs) to the House, and for the publishing and sale of Acts of Parliament (including reprinted Acts), legislative instruments (including reprinted legislative instruments), and reprints of Imperial enactments and Imperial subordinate legislation. The New Zealand Legislation (NZL) system is a complete drafting and publishing system. The drafting system is also available to the Office of the Clerk and Inland Revenue Department drafting staff. The system enables the PCO to provide public access to up-to-date official legislation in printed form, and in electronic form on the NZL website at www.legislation.govt.nz. The PCO will ensure that New Zealand legislation (including Bills and SOPs) continues to be readily accessible to the public in a timely manner and in an accurate and authoritative form. It is fundamental to the effective operation of the rule of law in a democracy that the people governed by the law have access to the rules by which they are governed. Continual maintenance and development of the system that is used to draft and publish New Zealand legislation will ensure that better access is provided. The PCO also provides a website, on a trial basis, that publishes disclosure statements (these are departmental documents that provide information about the development and content of legislation proposed by the Government; they seek to assist the parliamentary and public scrutiny of a Bill or SOP). Disclosure statements are provided on this website for all government Bills (with limited exceptions) and substantive SOPs introduced or released since 29 July 2013. This will be extended at a later date to include legislative disclosure statements for disallowable instruments drafted by the PCO. The PCO provides the LDAC website and took over responsibility from the Law Commission in 2015 for its content. The LDAC terms of reference includes the provision of advice to departments on the development of legislative proposals and on drafting instructions to the PCO. Parliamentary Service Parliamentary Service provides a range of services including financial accounting services, payroll, and the parliamentary core computing network. Memoranda of Understanding or Service Level Agreements are in place to manage the provision of these services. Office of the Clerk of the House of Representatives The PCO works closely with the Office of the Clerk and has developed a Memorandum of Understanding with that office for the processing, printing, supply, and publication of legislation. Instructing departments and agencies The PCO has extensive working relationships with all central government departments and agencies in terms of taking instructions from them for the drafting of new and amending legislation and providing links and electronic “feeds” from the New Zealand Legislation (NZL) website. Inland Revenue Department The PCO provides Inland Revenue Department’s drafting unit access to the NZL system. This unit is responsible under current arrangements for the drafting of tax legislation. The PCO has developed a Memorandum of Understanding with that department for the processing, printing, supply, and publication of legislation. Cabinet Office The PCO works closely with the Legislation Coordinator in the Cabinet Office, whose role is to provide support to the Government of the day in developing, monitoring, and modifying the legislation programme, and with the Secretary of the Cabinet Legislation Committee. Leader of the House The PCO works closely with the offices of the Leader of the House and Deputy Leader of House in assisting with the progress of Government legislation through the House of Representatives. Printlink The PCO fulfils its obligation to publish hard-copy New Zealand legislation, through a contract with Printlink, for the printing, distribution, and sale of printed legislation. Revera Revera provides the PCO with infrastructure-as-a-service and desktop-as-a-service products which includes maintenance and support of the NZL System. All users of legislation The PCO provides public access to up-to-date official legislation on the NZL website at www.legislation.govt.nz. Click on the graphic below to open a larger version in a new window. the level of resourcing the PCO can provide to Pacific Island nations for legislative drafting assistance, training, and mentoring. This will be determined by a combination of: external funding availability, requests for assistance from countries outside the Realm of New Zealand (Cook Islands, Tokelau, and Niue) and from agencies that also provide assistance to Pacific Island nations (e.g. United Nations) and the requirements of Pacific Island nations’ legislation programmes. the level of resourcing the PCO can provide to the Legislation Design and Advisory Committee. The PCO will keep under review further development of this service and the cost pressures associated with any growth in its provision to ensure that it does not adversely affect the financing of the PCO core statutory functions. one further personnel-related pressure is coping with tight deadlines, heavy workloads, or changing legislative drafting priorities. To manage, the PCO will continue to work with Ministers, instructing agencies and the Cabinet Office when they are developing their legislative priorities and timetables as part of the legislative programme and subsequent additions and modifications to it during the year. The PCO currently expects its financial position to remain as sustainable beyond this four-year plan. The two areas of our workforce that are critical to the achievement of the PCO’s results over the next four years are as follows. The Information Systems team manages the PCO’s major asset, the New Zealand Legislation System (NZLS). The NZLS is a complex, highly customised system, heavily reliant for its maintenance and development on the institutional memory inherent in the Information Systems Team. The PCO completed a review of this team in 2015 to determine if the configuration and skill mix of its personnel was appropriate and implemented the necessary changes in the 2015/16 year. The PCO has recognised there is a risk of losing institutional knowledge and are reducing that risk through the on-going simplification of the NZLS. This is addressed in the current Information Systems Strategic Plan (ISSP). The top five areas of people capability that the PCO is seeking to build over the next four years to deliver its business results, and what the PCO is doing to achieve this shift, are set out below. Leadership skills – the PCO will continue and expand its programme of secondments to and from instructing agencies and other Commonwealth drafting offices to provide development and training for its staff as well as building better understanding and knowledge within other agencies. Strategic thinking – the PCO intends to nominate some of its tier 2 and 3 managers to participate in Career Boards, which are part of a planned process supporting senior leader career development across the State Services. Collaborative skills – the PCO will seek to reinforce its one-office culture through reviews of workflow processes and consolidation of all staff within two floors as part of an office refit. Financial management – to increase PCO managers’ skills and understanding by providing them with access to the PCO’s financial information system. Skill transformation - to ensure the skills and knowledge of PCO staff constantly evolves to meet the organisation’s future needs and to ensure we remain fit for purpose. No roles/positions are expected to be difficult to fill over the next 12 months. These roles provide a specialist legislative proofreading service. The PCO team of Publications Officers are provided with ongoing training to assist with proofreading during workload peaks. The applicants for these roles must have experience with, and knowledge of, a number of mark-up languages used with legislation. The PCO team of Legislation Officers are provided with ongoing training to assist with checking compilations during workload peaks. There key workforce risks facing the PCO, and the actions that will be taken to address these over the next four years, are set out below. (1) legislative drafting outputs that have been agreed with the government cannot be met due to tight deadlines, unsettled policy The PCO will attend regular meetings with the Leader of the House to discuss the legislative programme. More legislative drafting staff may be required to meet agreed deadlines. (2) the PCO cannot deliver outputs with the agreed quality and timeliness standards due to a lack of skilled staff. The PCO will ensure there is an appropriate career structure and adequate succession planning in place for key staff. Fixed term staff or external contractors may have to be engaged on a short-basis basis to ensure delivery standards are achieved. Knowledge retention: the Information Systems (IS) team is augmented by external contractors chosen through the establishment of a panel. This operating model needs to ensure that knowledge and intellectual property is managed, captured, and stored within the permanent team to ensure ongoing services are maintained. The PCO will ensure there is a managed capability and development plan in place to ensure the right knowledge is spread across the IS team and that there is no single dependency on one person. Processes will be put in place to update documentation and to use one central repository for the storage and access of the knowledge. The PCO’s reliance on external contractors may be required in the short-term but is expected to decrease over the longer term as PCO deploys common IT capabilities across the organisation. Staff retention: the PCO is reliant on a relatively small IS team with key knowledge of PCO systems. If key staff were to leave it might result in PCO having difficulties in implementing its IS work programmes. The IS team structure has been reviewed and two Team Leader positions created and filled. The PCO will ensure IS team members have the opportunity to grow capability and have a career direction that coincides with a personal development plan. As the capacity and knowledge in the team grows, it will reduce the use of external contractors. In the meantime, the PCO will ensure there is adequate external coverage available to ensure enough capability for the IS work programme to be delivered. As shown in the table below the PCO expects to increase its position numbers by 5.75 FTEs, mainly though the recruitment of Parliamentary Counsel and the creation of two new roles in the Information Systems team, although it should be noted that in the year to 30 June 2016, three PCO staff commenced 12 months leave without pay. The total number of positions is unlikely to change significantly over the period of this four-year plan, however the composition of individual business units may change to reflect changing priorities. a proportion of the workforce cost increases is expected to be offset through the effect of attrition whereby new employees are likely to start at lower rates than those leaving the organisation.